James LeFebvre, 50, right, of Milford, N.H., was notified that steroid injections he received on Sept. 20 were potentially contaminated and tied to a meningitis outbreak. 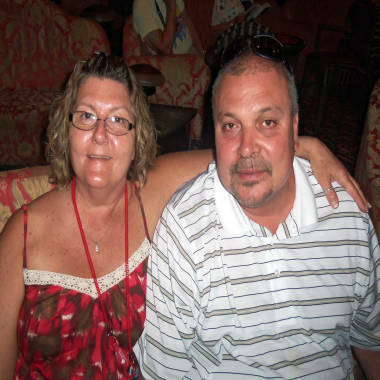 His wife, Fran LeFebvre, 57, also received shots, but they weren't linked to the outbreak. James Lefebvre has had a bad back for years, but after learning last week that he may have received contaminated steroid injections now tied to at least 105 illnesses and eight deaths, his trashed discs are the least of his worries. The retired drywaller is among some 13,000 people nationwide who may have been exposed to tainted epidural drugs linked to a large and growing outbreak of fungal meningitis, according to federal health officials. Seventy-six pain clinics nationwide received three suspect lots of methylprednisolone acetate, the drug linked to the cases of meningitis, an inflammation of the protective membranes of the brain and spinal cord. That included PainCare, the New Hampshire clinic where Lefebvre received injections of the drug on Sept. 20. Lefebvre said he feels fine, though he might have had a stiff neck, one of the symptoms of meningitis. He was called back to the clinic for a lumbar puncture to check whether his cerebrospinal fluid grows either of two types of fungus, Aspergillus and Exserohilum, found in nine other patients. That uncertainty is rampant among the other patients notified by the pain centers that received drugs from the New England Compounding Center of Framingham, Mass. The firm has closed voluntarily, relinquished its state pharmacy license and recalled all of its products, which include not just the steroids, but also painkillers and dozens of other drugs. CDC officials said the potentially tainted shots were first given May 21. Lefebvre's wife, Fran, 57, got shots of recalled drugs from the clinic, too, but they weren't associated with the meningitis outbreak, she said. The pharmacy sent products to clinics in 23 states: California, Connecticut, Florida, Georgia, Idaho, Illinois, Indiana, Maryland, Michigan, Minnesota, North Carolina, New Hampshire, New Jersey, Nevada, New York, Ohio, Pennsylvania, Rhode Island, South Carolina, Tennessee, Virginia, Texas, and West Virginia, the CDC says. So far, infections have been detected in nine states. At PainCare, which is headquartered in Somersworth, N.H., staff members have contacted 212 people in the high-risk category, those who received injection steroids from the potentially tainted lots, said Dr. Michael J. O’Connell, the firm’s chief executive. The clinic has received federal help from the Centers for Disease Control and Prevention and the Food and Drug Administration to ensure they track down every patient potentially affected. “We have been going at this 16 hours a day,” said O’Connell – ever since the clinic was notified of the potential danger and recall on Sept. 26. So far, about a third of the patients contacted have symptoms that “sound quite suspicious,” O’Connell said. Another 40, like Lefebvre, have had samples taken to see whether the fungi grow in culture, a process that can take up to two weeks. Several patients, perhaps four or five, have had serious symptoms consistent with meningitis, including stroke. One has received anti-fungal medication to fight fungal meningitis, O’Connell said. Meningitis is typically caused by bacteria or viruses, but it also can be caused by fungi and parasites. Clinic staff members are monitoring patients extremely closely at the New Hampshire sites and elsewhere. Federal, state and local health officials have taken great pains to notify people. In Tennessee, for instance, health workers contacted 66 people last weekend who may have been infected, in some cases going door-to-door to notify them. Knowing you’ve been exposed isn’t easy, said LeFebvre. Patients are monitoring themselves for symptoms including headache, fever, nausea, stiff neck and sensitivity to bright light. Some worried patients are flooding local emergency rooms looking for reassurance, O'Connell said. Patients who received injections and are concerned should contact their doctors, officials say. Lefebvre would like to be treated with the powerful anti-fungal drugs used against the infection, including voriconazole and amphotericin, but doctors want to use the drugs only on the most critical patients because they can cause dire side effects, including liver and kidney problems. Compounding pharmacies such as NECC receive less federal oversight than other drug suppliers, an FDA spokeswoman said. The day-to-day operations are regulated by state boards of pharmacy and compounded drugs are not approved by the FDA and do not undergo review for safety and effectiveness before they’re put on the market. The Massachusetts pharmacy was only one of three or four suppliers to O’Connell’s clinics, whose two main locations typically give about 100 epidural steroid shots a week. Still, O'Connell said, the fall-out is far from over. The number of known patients has grown to more than 105 with eight deaths after tainted steroid injections were linked to a fast-growing meningitis outbreak. NBC's Tom Costello reports.